Read Feng Shui Real Cases here….since some of the testimony are verbal while some customers prefer privacy. It has been our policy to maintain privacy for our client and as such photos are filtered accordingly. Case done on April 28, 2018 just before the GE 14. Got the feedback 30/9/18. Real Feng Shui is as sure as the echo of sound. Thanks to clients who keeps me updated and happy that our services has helped them improved. Then another update on 22/10/18. mid June 2017. Feed back received on 7 Sept 2017. Type of premise: business retail. 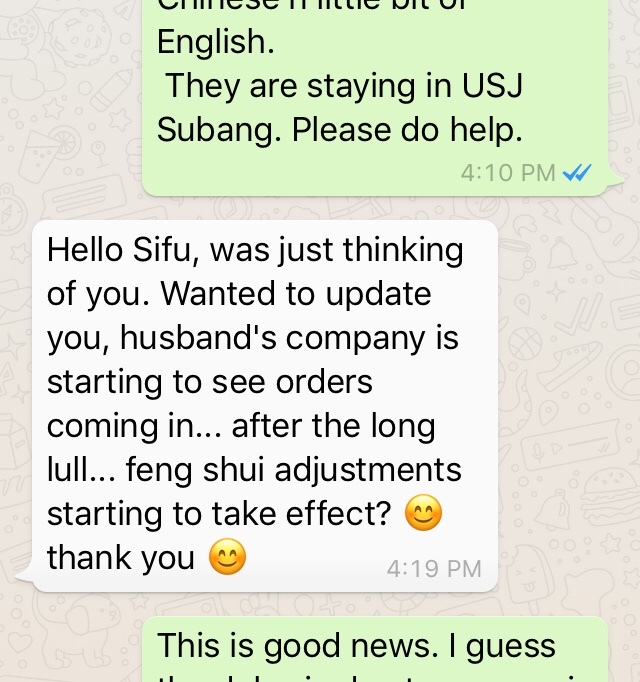 I would like to take this pleasure to pen this testimony with gratitude towards Master Alan Chong for his meticulous arrangement of Fengshui in my shop and my house and would like to extend my thanks to him. Having known him through facebook for more than a year, i would like to call him a friend because what he offers, exceed the boundary of “business”. This is definitely 缘. We are no longer in a Master/Customer relationship and he is always ready to help but i will continue calling him Master Alan because of respect for his talent and knowledge. The Shop I own a retail outlet toiling for 17 years shifting 3 times throughout the period. Life was initially quite secured for the first 12 years and it was ok until we shifted from the original place and then things started going downhill despite consulting an experienced non lineage fengshui master. He is afterall, the one who adviced us to shift in the first place saying the land luck (地运) is diminishing fast. After holding on for 2 years and incurred massive losses, i have no choice but to shift over to a less desirable location for its low rental for the third time. A fighter I am, i told my wife to give me 6 months to turn things around if not, i will go back to employment. How will i cope with employment after being a boss for so long is beyond my imagination but fight i must. To fast forward the 4 years I worked in this shop, i managed to survive but not without obstacles. I was in a mountain of debts. I engaged Master Alan’s service and he begun his analysis over the shop. Being a realistic person I am, I did not expect a miracle. I will be contented even if there is a little changes. I have afterall gone through some of the worst times from being broke to debt-ridden. My objective then was to make the business profitble in the shortest time possible and sell it. Eventhough i have achieved profitablity but I somehow slipped into debts. Its like the bleeding never stop. I don’t understand how. A few alteration in the shop later, i have felt first the energy in the shop has changed. Witness not only by me but the customers who came and commented. Business begin to stablise gradually over the months and the “bleeding wound” is drying up. The change of direction of the office door breath life into the business. The partnership i started outside begin to materialise and ideas has been flooding in where I charted many proposals and directions in the office itself. Best of all, there are prospecting buyers making inquiry to take over the business which i fail to get throughout the 4 years i tried after rebuilding the business. For once after so many years i felt the intense energy of enthusiasm in me to make things work which i would attribute to the change of direction of the working table. It has been 7 months now since having Master Alan over and the effect of his analysis is taking shape. He has made me believe again that Fengshui does help despite my previous bad experience. I shall call this Testimony Part One. Part Two i shall talk about my house. Good day to all and Thank you Master Alan. – Khai, Kuala Lumpur. The course itself is structure and informative, telling a lot about why this and that, making the understanding meaningful. There is one very critical part of the course – Oral Secret. This differentiate make the true master. [of course one has to be sincere and show faith in his Feng Shui method]. As time passes, the progress has been good. from a flat graph when I first did the alternations, today its performing pretty well. Of course the journey has its ups and downs but the overall result trend, as far as I am concerned, has been satisfactory. Audited 3 months ago, your last bastion for feng shui consultancy..
Audited about 1 month ago. Client update – Some changes done and 1 more change just completed. Here is the result! Superbly a Good News! Client promoted the CEO after good feng shui done for him! So happy for him! A humble Dato too. Correct placement of Table according to XKDG, Good sectoring, Date selection to move in & matching Man to the Flying Star Feng Shui formation! Things are progressing better for us, I can see more jobs coming. Next week changing the stove position. I am happy to tell you I have finally broke my (shop) sales record. Thank you for your help. The funny thing is I sleep very well in any position. I go to bed at about 10 pm and sleep through till 6am. All Drs’ are amazed that I don’t get up in the night to use the toilet like I used to be. Alice’s better…. at least not panic easily. Should say overall much better than before. – J. Yik (S’pore) 7 months after audit. Good, Everything running smoothly & Can see lots of opp. Try to work on it but at least invested in another hse. Got it at a good value. 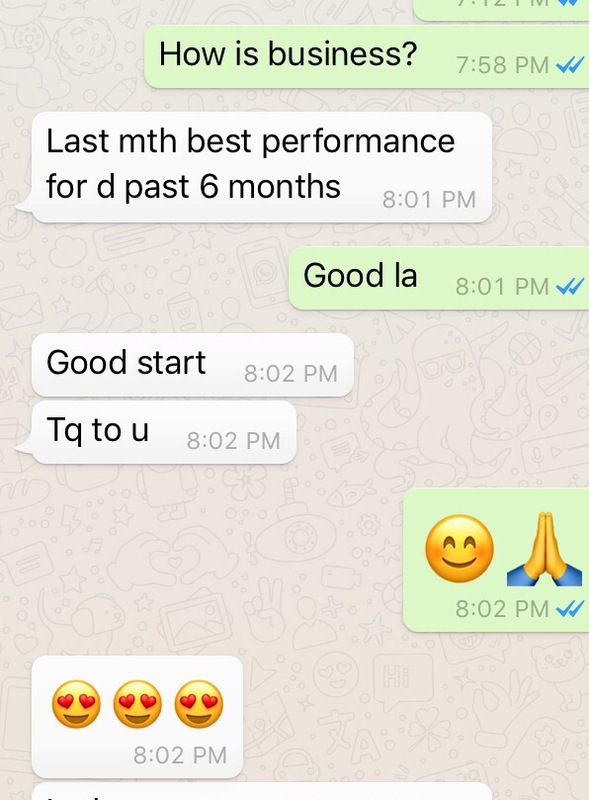 🙂 – Caryn K (KL) 6 months after audit. Mr Alan, I am happy that I found a good walk in client & recently my tenant have been able to his rent on time. Thank you. – Chee Tuck. Hi bro, my bro will start work on Monday (after jobless for 1 year). Hope that he gets a job that he like. The electric stove was installed this afternoon… Once again, thanks for everything. – Kymn Lim (S’pore) 3weeks after audit. The children’s results improved after moving to this new house. I’m now very happy that they are more focused and willing to study. – Mdm Tang. 3 months later, Mr Chan reported they have broken the threshold they have been targeting for a while.